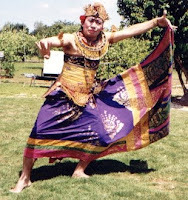 Kebyar Duduk is balinese solo exhibition dance that is performed to the accompaniment of a gamelan ensemble. Developed and popularized in the 1920s by a famous dancer-choreographer named I Nyoman Mario. A popular form of the dance is the Kebyar Duduk, which is performed while the dancer is sitting cross-legged. Any limitations brought about by the lack of mobility in the lower limbs is more than compensated for by subtle upper-body movements and highly nuanced facial expressions. In the Kebyar Trompong, the performer plays a percussion instrument called the trompong while dancing and dexterously twirling the tromping sticks in his hand.